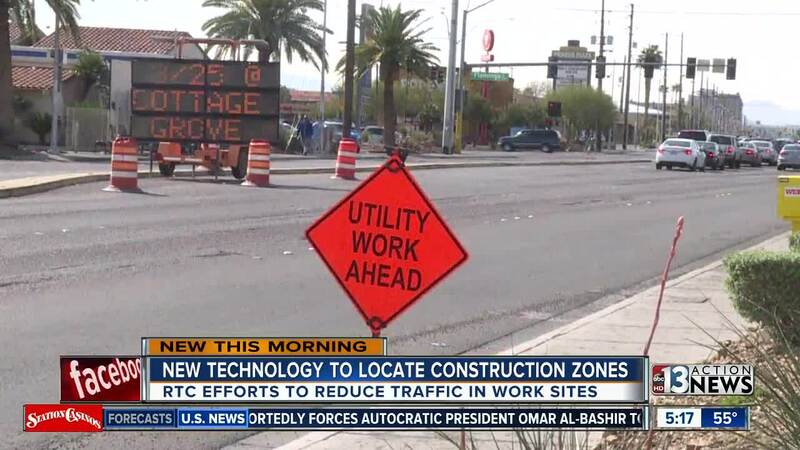 LAS VEGAS (KTNV) — New technology could make your drive through construction zones quicker and safer. It's part of the Regional Transit Commission's ongoing effort to reduce traffic through those work zones. "We're calling it the work zone of the future, but all the pieces and parts are already here," says John Penuelas, a Director of Engineering with the RTC. The RTC, in partnership with Nexar, is using smart devices to locate construction zones, send that information to drivers, and then analyze how that zone is impacting traffic. GPS devices are installed on cones and signs to send their location to the RTC. Then, high tech devices are installed on cars partnering with the RTC to help gather information about traffic flow. The RTC can then see how the work zone is impacting traffic, and allows them to make any changes if they need to. Also, that information can sent to the smartphone app Waze to notify drivers of those construction zones, and give information on closures or alternate routes. "It helps increase safety because people can get the notification that there's a work zone ahead of them well before seeing it. With so many constructiono zones across the valley, and with so many different agencies working them, the RTC hopes this technology can help make your drive quicker and safer. This is just a pilot program right now, with the technology being tested out in parts of downtown. However, the RTC does have plans to expand this service.